Zambian football is mourning the passing of legendary commentator Dennis Liwewe, who died on Tuesday aged 78. Known as the ‘Voice of Zambian football’ Liwewe succumbed to liver complications in a Lusaka hospital. Liwewe hailed from neighbouring Malawi and began his journalism career by working as a reporter at a newspaper owned by mines in northern Zambia. The former BBC correspondent was later to travel 96 times to 42 countries around the world in his 41-year illustrious career; broadcasting from different stadiums to millions of people who enjoyed his distinct voice on the airwaves. At his peak, Liwewe who coined the nickname “KK 11” in reference to the Zambian team that died in the 1993 Gabon Crash, became so popular that fans would troop to stadia to watch live games whilst listening to his commentaries on radio. Founding Zambia president Kenneth Kaunda recognised Liwewe’s influence on football in the country and awarded him the prestigious Order of Distinguished Service in 1977. A trained teacher by profession, Liwewe was scheduled to be on the plane that crashed in 1993 but he missed the fateful flight. The death of the entire team took a toll on Liwewe, who, on doctor’s advice, retired from football commentaries to become an inspirational speaker. Zambia’s sports minister Chishimba Kambwili told BBC Sport: “We are sad as government. We can’t have lost such a man at this stage. He dedicated all his life to football. Liwewe’s death has shocked his personal friend and former Zambia president Rupiah Banda. “Dennis like was a member of my family. I became so close to him because we travelled all over Africa and outside with him,” he said. Everything about Liwewe, from his private life to social discussions, revolved around football. There was never a boring moment in the company of the devout Anglican church member. He once told me a story of how his widow Sylvia had accepted his love proposal after one-and-a-half years of tirelessly trying. “It took me 18 months of continuous wave-after-wave bombardment using a 5-3-2 formation because my wife was a hard nut to crack”, he said as Sylvia looked on. The formation in this case denoted the aggression with which he wanted Sylvia. “She was so beautiful; she had this natural brown complexion – she looked as red as a red card,” he added. Even after Sylvia eventually accepted his proposal, things did not exactly flow, Liwewe said. He recollected that one day, he and his friends hosted a party which was supposed to be his first date with Sylvia. “Unfortunately, that day I hit a crossbar because she refused to come with me. Having her at the party was like having a through ball but I failed to capitalise,” he said as everyone in his living room burst into laughter. His greatest ambition was to see Zambia win the Africa Cup and qualify for the World Cup. And when Zambia won the Africa Cup of Nations in 2012, he was so happy that he even threatened to come out football commentating retirement. Liwewe, who only had one kidney, saw his health deteriorate rapidly this year. He was in and out of hospital and was even flown to South Africa for specialist treatment on his liver. He required a liver transplant but that could not be done on account of his age. But even in his sickness, he continued with his football language. When Liwewe retired from corresponding for the BBC, I took over that role and because of the relationship I have with his family, he referred to me as his nephew. And I called him Uncle. When I visited him three weeks ago, he looked very weak, had lost a huge amount of weight and spoke in low tones. He then remarked: “The state of affairs won’t remain like this forever. I will bounce back in the second half using a 4-4-2 formation. Sadly, the final whistle has blown on Liwewe’s life without him making what would have been a famous comeback. Zambian and African football will miss him. Posted on 23rd April 2014 by newsafrica. 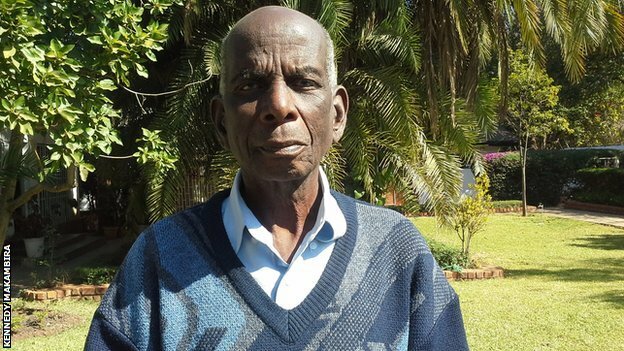 This entry was posted in Africa, Headlines, Zambia and tagged Africa, Africa Cup of Nations, BBC, Kenneth Kaunda, Liwewe, Lusaka, Rupiah Banda, Zambia. Bookmark the permalink.